Radon gas can be harmful to your health and the health of your family. It is a radioactive gas created by the decay of materials such as uranium. Radon gas is natural and it is present in the air. The source of radon is from groundwater, rocks and soil. Underneath your home, there is soil and rocks and the gas enters your home this way. Each year in the United States there are more than 20,000 deaths due to radon gas. It is something that you need to take seriously for the protection of your family. All homes will have a level of radon present which is safe, but every 1 in 15 homes will have elevated radon levels which are not safe. Without a radon gas test, you will never know if your home has elevated radon levels or not. You cannot see radon gas nor can you smell it or taste it. So if you want to ensure that your home has safe levels of radon then you need to conduct a test. By using these methods you can find out whether the radon levels in your home are too high and then you can take remedial action to mitigate this. You need to make the decision on which type of test to go for and we will assist you to make that decision in this article. 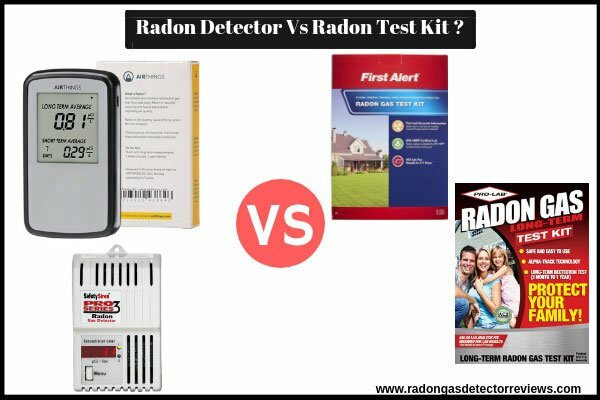 Radon Gas Detector Vs Radon Test Kit – (Comparison) Which Should You Use? Should you consider a Professional Test? Final Words for Radon Gas Detector Vs Home Radon Test Kit? Short term home testing kits are fine but they will not provide averages over the longer term. Radon gas levels vary over time so the best way to protect your family is to monitor over the long term to establish an average. Home radon testers are active devices that usually have a lot of useful features. When you use the home radon test kits there are no power requirements but the electronic radon detectors do require batteries or mains power. You will pay quite a bit more for a radon gas detector but the long term benefits will be worth it. Most electronic radon gas detectors will monitor the radon alpha particles in the air and provide a current reading for the short term and an average reading for the long term. If the radon levels exceed the safe threshold then an alarm will sound. Radon gas levels often rise at different times so using this kind of active tester is highly recommended. This is a high-quality radon tester that has a lot of good features and is our top recommendation. This is a very accurate radon tester that provides instant results and you will find it easy to use. There is a screen where you can see both short term and long term radon level averages. The customers rated this radon detector highly. The RADEX MR107 is another accurate electronic radon tester which is simple to set up and use. This is different in that you have to connect the tester to a Windows-based computer to view the results stored. Customers liked this tester even though you need a PC to see the statistics. You can access the radon test data collected by this tester using your iPhone or Android smartphone. It all connects using Bluetooth and the results are very accurate. It’s easy to use the tester and the customer reviews are mainly positive. This is a good electronic radon gas tester that’s available for a good price. The tester is accurate and refreshes every hour and it “self-tests” every 24 hours. You need to plug this tester into the mains and the EPA has evaluated the device. Customer reviews are good too. This is a battery powered radon tester and you can view statistics using your Android or iPhone. You can see daily, weekly, monthly and yearly radon levels. The accuracy is OK and it’s easy to use. If you just want a quick test to determine whether or not you have an elevated radon level in your home then you can do this easily by using a home radon test kit. It is important that you get accurate results from your home test kit so you will need to follow the manufacturer’s instructions precisely. A home radon test kit tests for radon in a passive way. There are usually two types of home radon test kit available and these are alpha track or charcoal. With an alpha track, your home tester will have a special plastic film inside of it and when the radon alpha particles strike the film they make a mark on it. With a charcoal based home radon test kit, the charcoal within the tester will absorb radon from the air over a period of time. When you have used your home radon test kit for the period specified you will need to send the used test kit to a testing laboratory which the manufacturer specifies. Once the laboratory receives your test kit they will start their analysis. With an alpha track based kit, they will count the number of marks or “tracks” left by the radon alpha particles and from this, they will be able to calculate the radon levels in your home. For a charcoal tester, the lab will either count the radioactive particles or convert them to light to determine the radon level. Usually, the laboratory will send you the test results via email a few days after testing. You will need to place the home test kit at the lowest level that you live in. If you have a basement and hardly use it then this is not the ideal location. The tester needs to be in a location where you and your family regularly use. You need to test the amount of radon in the air that you are breathing every day. When you are using the radon test kit be sure to keep all windows and doors closed for at least 12 hours prior to the test and for the entire duration of the test. It is very important that your home radon tester kit is not disturbed for the entire duration of the test. If you have young children or pets then choose the location wisely. Test periods vary from 2 days to 4 days and the manufacturer will make this clear in their instructions. Once the test period has expired you will need to place the tester in a sealed envelope (normally you will get a sealable envelope with the kit) and send to the laboratory for testing as directed by the test kit manufacturer. this is a very good home radon test kit provided by a reputable American company that has many positive customer reviews. The test results are accurate and the test kit is on the EPA measurement proficiency list. It is available at a good price too. You can use this home test kit from 3-7 days. You will get accurate results and it’s very easy to use. This test kit also has positive reviews from customers and the price is good. This product has two testing kits. The kit is alpha track and you can use it for longer-term testing than charcoal based testers. It’s easy to use this kit which the EPA verifies and the national consumer group rates it number one. You will get accurate results from this test kit and there is a QA/QC test canister for short term testing. The RAdata laboratory has EPA approval and their results are very accurate. You will pay a little more for this test kit but you will receive very accurate results. This is another home kit for the longer term. This is a good home kit but the biggest drawback is that you have to pay a further $40 for a lab test where the others include this in the price. The results are usually accurate. It is going to cost you around $150 – $200 for a professional to test your home for radon gas. This is a one-off test and in our opinion, you will be better off purchasing a home test kit if you just need a short term result. We would recommend an electronic radon tester over a single use home kit. It is really important that you monitor the radon levels on a regular basis because the levels can change over time. I am a certified radon gas measurement specialist for both air and water with an experience of more than 5 years in this field..Healthy Homes, Healthy You ! ! ! RadonGasDetectorReviews.com is a participant in the Amazon Services LLC Associates Program, an affiliate advertising program designed to provide a means for sites to earn advertising fees by advertising and linking to Amazon.com.